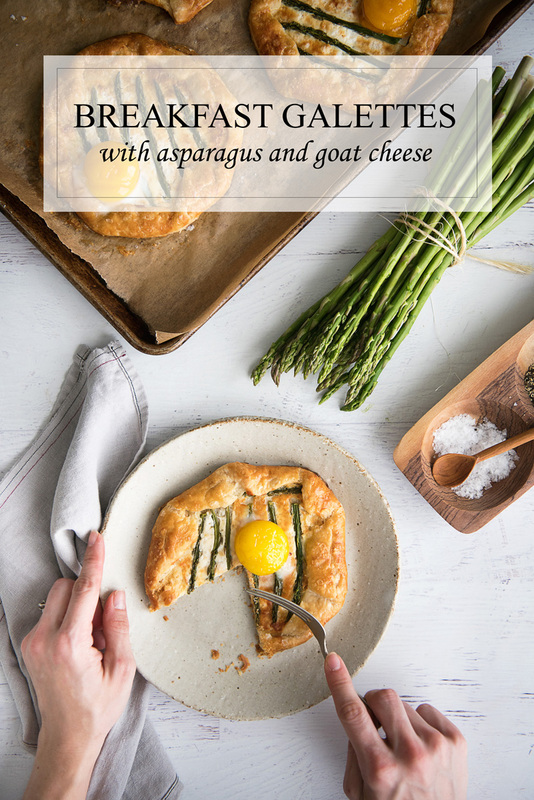 Asparagus goat cheese galettes are a great savory breakfast idea. This easy recipe features a make ahead dough and is topped with a runny egg yolk. Raise your hand if you’re obsessed with galettes! I’m not going to give up though, galettes deserve to have their moment. I make literally dozens of varieties of galettes, many of which you will find on A Side of Sweet. You’ll find all kinds, from savory to sweet. 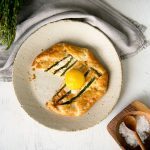 Galettes are so easy to make and they are sooo impressive! For the dough, you can use your favorite pie crust recipe, or even do a halfway homemade version with a store-bought pie dough. Prep is simple – just place your toppings on a round of dough and loosely fold the edges in. There’s no fancy technique and a little messier actually looks better in this case! I make them with everything from apples to mushrooms. They are perfect for any meal. 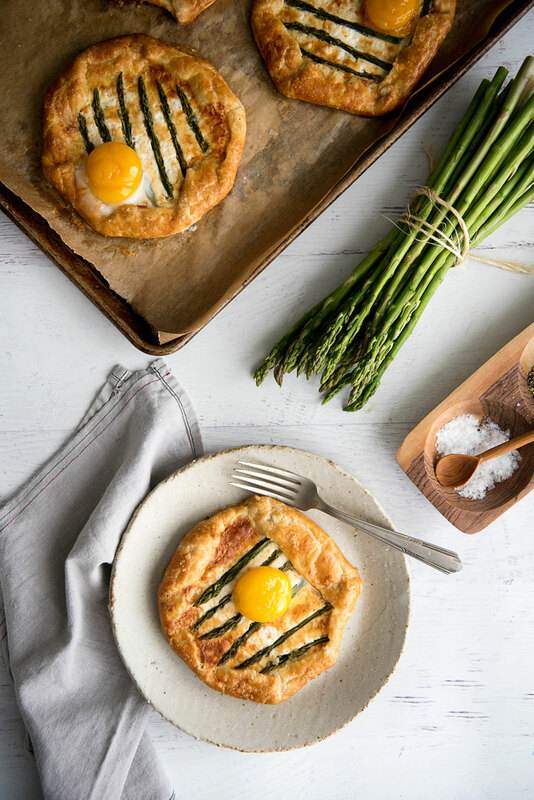 Wine pairing suggestion: My favorite way to enjoy these galettes is breakfast for dinner, ideally with a glass of Chardonnay. Chardonnay typically pairs well with goat cheese, so it’s perfect for this recipe. In a medium bowl, combine parmesan cheese, goat cheese and two egg whites. Beat with a hand mixer on high speed until smooth. Divide galette dough into 6 sections (recipe below). On a floured surface, roll each section into a 10-inch round. Spread a generous spoonful of the cheese mixture onto each round, leaving a 1-inch border. Trim asparagus stalks to about 3 to 4 inches long. Reserve remaining parts for other use. 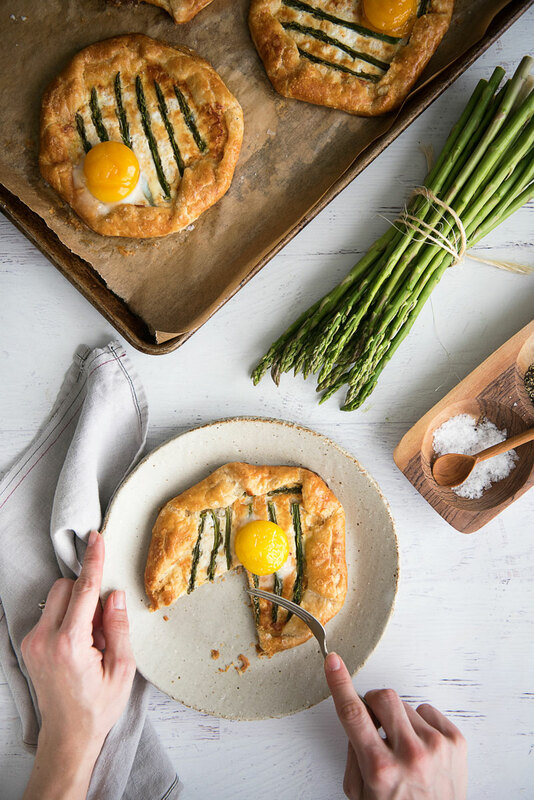 Arrange 5-6 asparagus stalks on each galette. Fold galette dough inwards in an overlapping fashion, leaving center exposed. Transfer to parchment paper-lined baking sheets. Brush exposed dough liberally with egg white. Sprinkle galettes with coarse sea salt. Bake for 35-45 minutes, until crust is golden brown. 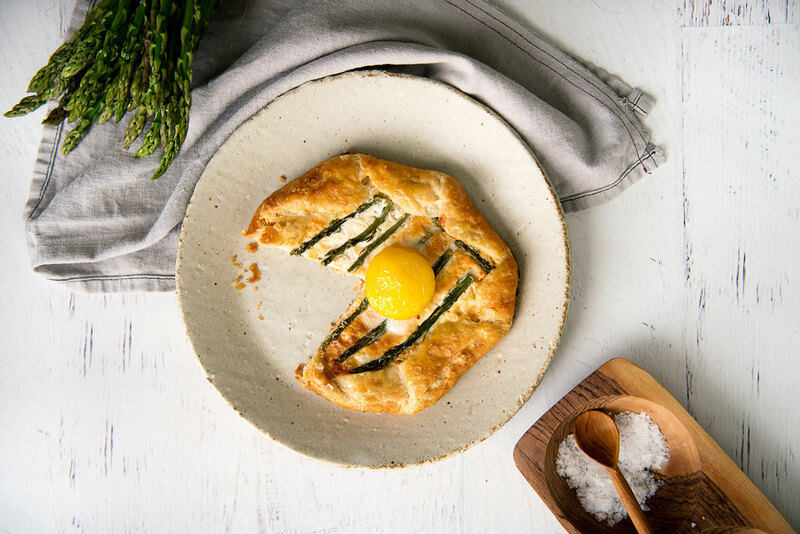 Gently place an egg yolk on each galette and bake another 3-4 minutes until yolk is set. Prepare your galette dough using these instructions. Alternatively, you can use your own two crust pie recipe or a store-bought pie dough. Let dough chill for at least three hours, ideally overnight. Galette dough is best made the night before, which will dramatically cut down on prep time the day of your meal! Hooray! I’m so glad to hear that!